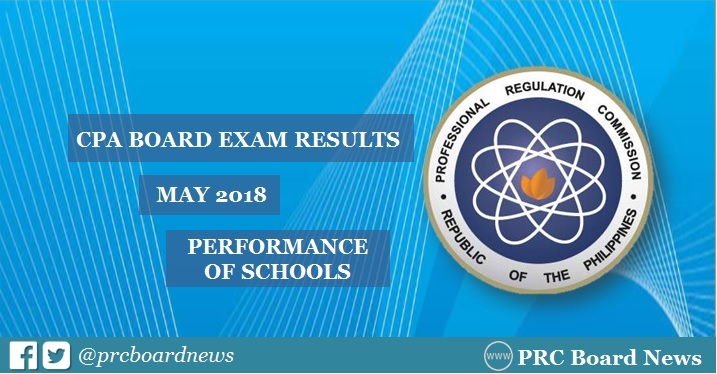 MANILA, Philippines - (Updated 5/28/2018) The Professional Regulation Commission (PRC) named the top performing schools in the May 2018 Certified Public Accountant (CPA) board exam on Monday, May 28 or in five (5) working days after the last day of exam. The complete results including the list of passers, top 10 (topnotchers) and performance of schools are available here as announced online. De La Salle University (DLSU) - Manila was the top performing school with 90.11% or 82 out of 91 takers passed. University of San Carlos (USC) camed in second spot with 83.72% or 72 out of 86 successfully hurdled the series of tests. PRC administered the licensure exam in the cities of Manila, Baguio, Cagayan de Oro, Cebu, Davao, Iloilo, Legaspi and Tacloban on May 13, 20 and 21, 2018. University of San Carlos (USC) topped the schools in the May 2017 CPA board exam garnering 94.29% or 66 out 70 passed the exam. De La Salle University (DLSU) - Manila and Ateneo de Naga University came in second and third, 85.87 and 80.30-percent respectively. In the May 2016 exams, DLSU-Manila led the schools with 93.10% or 54 out of 58 passed the exam. It was followed by University of Santo Tomas (UST) and University of San Jose Recoletos (USJR) on second and third spots, 90.32 and 81.20-percent respectively.